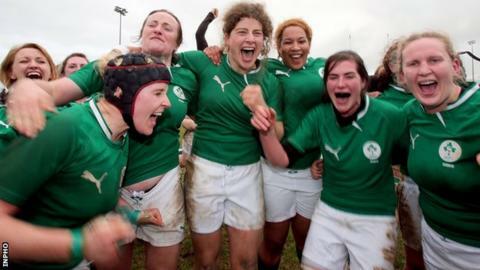 Ireland's Women will land their first Six Nations Triple Crown if they beat Scotland at Lasswade on Saturday. Philip Doyle's team opened the campaign by beating Wales 12-10 in Port Talbot and then enjoyed a superb 25-0 victory over England in Dublin. Not surprisingly, Ireland have named an unchanged team for Saturday's clash. "It is all about meeting the standards we set out against England. We are looking for consistency now to our game," said coach Doyle. "Our focus is on qualifying for the Women's Rugby World Cup and a win this weekend will bring us closer to that. "Scotland are formidable opponents. While results may not be going their way, they have strength that no other team has, and we are certainly not underestimating them." Scotland have yet to score a point in this year's championship, conceding 12 tries in a 76-0 defeat by England and then falling 8-0 at home to Italy. "Ireland had a fantastic win at home against England and, given the rugby they have played, deserve to be top of the table," said Scottish coach Karen Findlay. "They have been building season on season to achieve that kind of result, so fair play to them. "The response by our team in the Italy match was a big step in the right direction and we were unlucky not to have come away with a result." Becca Parker starts for Scotland having been a replacement in the Italy match, while back-rower Kelly Shields will win her first cap if she comes off the bench on Saturday. Scotland: S Johnston (RHC Cougars), A Sergeant (Richmond), S Dixon (RHC Cougars), L Ritchie (Carlisle), M Gaffney (Hillhead Jordanhill), T Griffith (RHC Cougars), L Dalgliesh (RHC Cougars), H Lockhart (Hillhead Jordanhill), S Quick (Murrayfield Wanderers), T Balmer (Worcester), L Wheeler (Richmond), B Parker (Hillhead Jordanhill), J Konkel (Hillhead Jordanhill), T Forsberg (Richmond), S Brown (Richmond). Replacements: B Dickens (Murrayfield Wanderers), S McKerlie-Hex (Murrayfield Wanderers), N McLeod (Morgan), B Millar-Mills (Worcester), K Shields (Murrayfield Wanderers), S Law (Murrayfield Wanderers), L Steven (Murrayfield Wanderers), L Neary (RHC Cougars). Ireland: N Briggs (UL Bohemians/Munster), A Baxter (Belfast Harlequins/Ulster), L Cantwell (Richmond/Exiles), J Murphy (Old Belvedere/Leinster), A Miller (Portlaoise/Connacht), N Stapleton (Old Belvedere/Leinster), L Muldoon (UWIC/Exiles), F Coghlan (UL Bohemians/Leinster), G Bourke (UL Bohemians/Munster), A Egan (Old Belvedere/Leinster), S Spence (Mowden Park Sharks/Exiles), M Louise Reilly (Old Belvedere/Leinster), S Fleming (Tralee/Munster), C Molloy (Bristol/Exiles), J Neville (UL Bohemians/Munster). Replacements: S Kennedy (City of Derry/Ulster), F Hayes (UL Bohemians/Munster), L Day (Waterloo/Exiles), L Dargan (Saracens RFC/Exile), L Guest (Highfield/Munster), A Davis (Blackrock College/Ulster), G Davitt (Cooke/Ulster), N Kavanagh (UL Bohemians/Munster).